Okay, 06AM contains three Turkish and one fake Turkish edit. They sound quite traditional but they all have a psychedelic electronic or percussive edge which makes them worth stretching a bit. As 05AM was delayed, this one can be considered way more delayed as 3 of the 4 tracks on this e.p. were waiting since early Salamanca days (the edit label I ran with Patrick Marsman and Marjolein Slick Chick), but in contrast to the previous release now the records were coming in from the factory one month earlier than expected, so here we go: Turkish Delights! 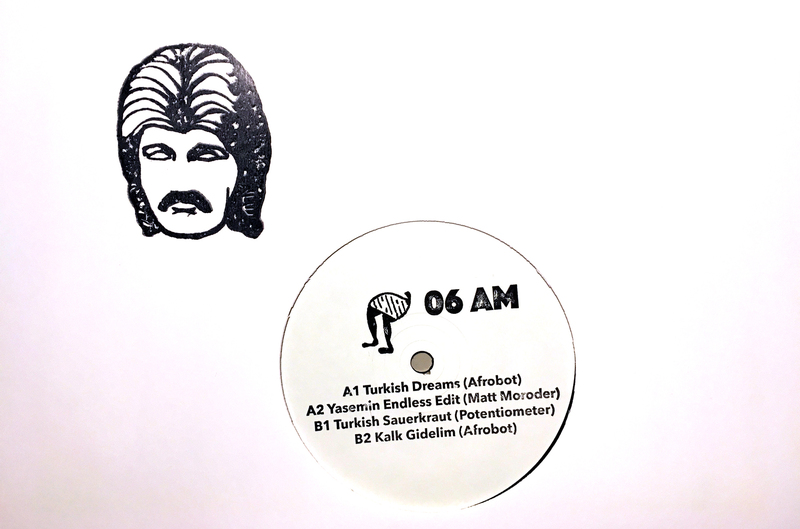 Turkish Dreams is an edit of this Turkish 7″ which I discovered on a cd that a friend (actually Frank who does the drawings for the stamps) copied for me of a Finders Keepers mix cd, and I loved that part and wanted to be able to play an extended version of it. All info about the final track you can find in this blog post! With another cool pic by Frank Koedoood – 06AM is out any moment from now! Available here: Bordello A Parigi, Phonica, RedEye, Juno, Deejay.de, Diskunion, Discopiu, Swordfish&Friend, last but not least Red Light Records and a whole bunch of other places.